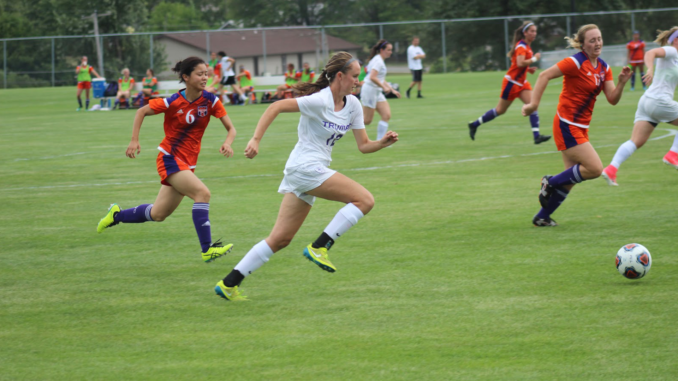 After coming off a 2-0 loss to Quincy University last Friday, the Truman State University women’s soccer team returned to Kirksville and played a 1-1 tie game Sunday in its home opener against University of Illinois-Springfield. The Purple and White had a strong showing in the first half, allowing only three shots total — none were attempts to score. Despite not scoring in the first half, the Bulldogs kept the pressure on the UIS defense with three of their own shots toward the goal. Truman broke the deadlock less than a minute into the second half with a goal from senior midfielder Delaney Kooken, assisted by redshirt sophomore midfielder Erin Chynoweth. The Bulldogs kept their lead for another 25 minutes during the second half until UIS evened the score with a goal of their own to force overtime. Head Coach Mike Cannon said the game against UIS was probably the most balanced match Truman has played this season. He said the team wants to follow through and capitalize on leads, but lead changes are rampant in sports. Cannon said the momentum swung to Springfield this time, and the Bulldogs might have played it too safe when it came to breaking the tie. He said a lot of the goals scored against the Bulldogs this season have resulted from small errors, but errors that can be corrected and controlled. Cannon said the team’s seven freshmen have big shoes to fill and had considerable playing time Sunday — a game in which two freshmen defenders Camryn Sprague and Leah Bolskar had starting positions. Cannon said the team is going to focus on building up experience for the freshmen and returners. Moving into this Friday’s match against William Jewell, senior midfielder Kelsey Murphy said the team is going to focus on working as a unit. Defensively, by helping out teammates instead of defending only their own marks, and offensively, by being mobile with the ball and going on the attack. She said if the team focuses on unity on and off the field, other factors will fall into place. Truman hosts two home games this weekend, against William Jewell Friday and Rockhurst on Sunday. The 0-2-2 Bulldogs are looking to snag their first win of the season, and the Bulldogs are looking to improve their conference standing from 1-1. Truman’s $40 Million Capital Campaign Enters its Final Year.